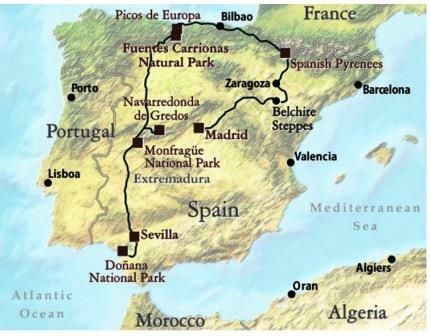 Tom and I are away for three weeks on a birding trip around Spain with Victor Emanuel Nature Tours. While officially it’s purely a birding trip, for us it’s just as much a food and wine trip. The VENT leaders are usually as good at choosing restaurants as they are at finding birds, so we look forward to some interesting meals. 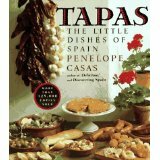 Anticipating the adventure a bit, and also to get us into the proper mood for Iberian-style eating, I made a modest tapas dinner the other day, using three recipes from Penelope Casas’ book Tapas: The Little Dishes of Spain. 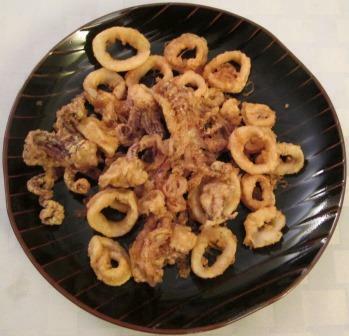 The main item was Fried Squid, Spanish-Style. 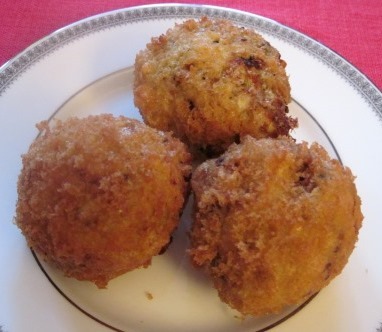 Casas calls this “a classic on the tapas circuit,” a dish likely to be available almost anywhere in Spain. If so, hooray! – because these were excellent. The squid had to be cut in rings, dried thoroughly, dusted with flour, dipped in egg, deep-fried for less than three minutes, and dressed with sea salt and lemon juice. They were beautifully tender and fresh-tasting. Alongside, I’d made an Onion Tortilla. 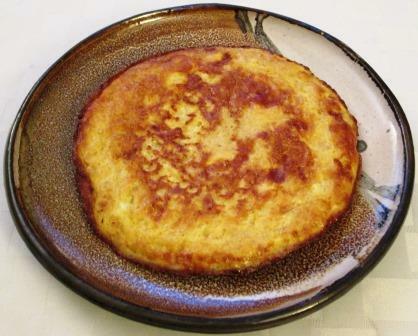 Normally, I make tortilla española, that luscious, thick, soft, eggy cake of fried potatoes and onions. This one had no potato but lots of minced sweet Spanish onions, which made it lighter but also delicious. 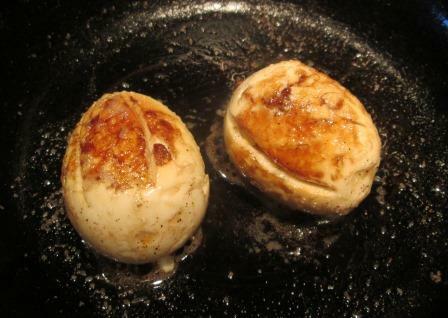 Even easier to make: Soften onions in olive oil; cool them; mix them into beaten eggs, milk, salt, and pepper; then cook the whole mixture very slowly in a pan until it just sets. It’s good hot, warm, or cool. 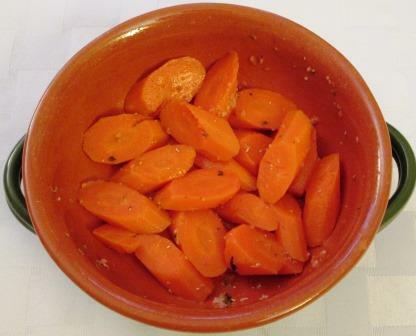 For a bright contrast with those two dishes, I made a little Cumin-flavored Carrot Salad – which Casas says is a specialty of a well-known bar in Cadiz. I simmered whole carrots in chicken broth and water until almost done; let them cool and sliced them; dressed them in wine vinegar, oregano, cumin, paprika, and salt, and left them to marinate all afternoon. Bracing! The three together made a very pleasant week-night supper. I have great hopes for our eating in Spain. I won’t be posting here again until well into May, but then I hope I’ll have some good dishes to write about from the trip. ¡Hasta la vista! For a dinner party for eight this week, I needed a vegetable dish that would be (a) autumnal, (b) good alongside a roasted capon, and (c) easy to finish, so I could concentrate on my barely adequate poultry carving ability and get all the filled plates to the table promptly. 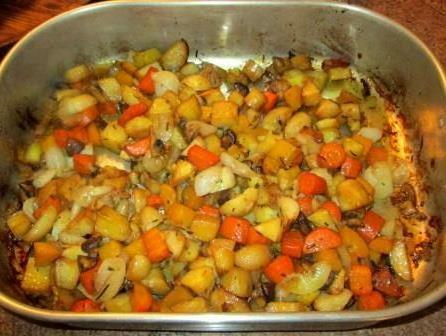 Roasted root vegetables turned out to be an ideal dish for the occasion. Preparation of the vegetables does take a fair amount of work, most of it peeling and chopping, but it can all be done well in advance. Even the roasting can be done early in the day: If anything, the dish is even better when reheated in the oven. And it’s good to have a number of people to feed: The more diners there are, the greater the variety of vegetables you can include. 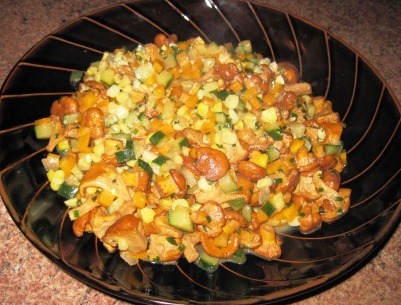 Though mushrooms aren’t a root vegetable, I like to add them for textural contrast, as well as flavor. When all the roots have become meltingly tender, the ‘shrooms remain a little al dente. Other times I’ve tossed in green beans, broccoli, or asparagus. 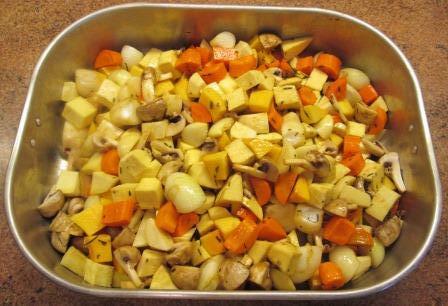 My faithful knife man and I started work in the morning of the dinner party – I peeling all the veg and he reducing them to more-or-less one-inch chunks. I put them in my largest roasting pan and tossed them with olive oil, balsamic vinegar, chopped fresh rosemary, and salt. 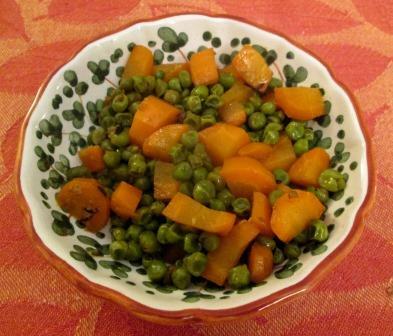 Recipes I’ve sometimes tried for the dish say to spread the vegetables in a single layer in the roasting pan. I’ve found that isn’t necessary. In fact, in a 450° oven, it’s too easy to dry them out and turn them into leather that way. 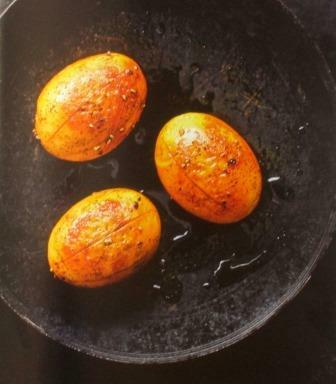 (Those recipes also say to use extra-virgin olive oil, which I feel is wasted in long-cooked dishes.) 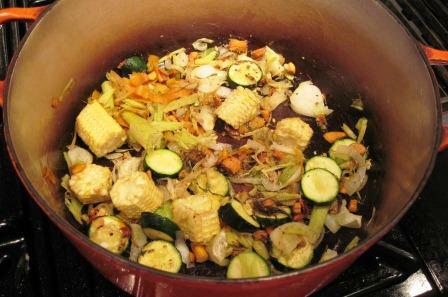 I just stir my vegetables around every 15 minutes or so as they cook. In that close contact, they render quite a bit of liquid at first, which I think helps keep them tender and blend their flavors, and it all evaporates by the time they’re done. The denser the batch, the longer it takes to cook, of course. Mine this time took about 1½ hours. When it was done, I let it cool and set it aside, covered, in a cool place. In the evening I stirred a little more olive oil into the vegetables and heated them through, uncovered, in a 375° oven. As always, they were excellent. Their natural sugars had caramelized just enough, and the flavors had had time to harmonize beautifully. 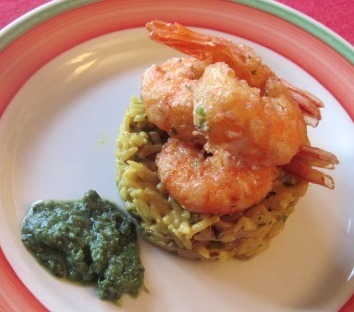 This is a dish that naturally combines the pleasures of comfort food with an almost haute cuisine subtlety. When I offered seconds on the main course, I had more takers for the vegetables than the capon. 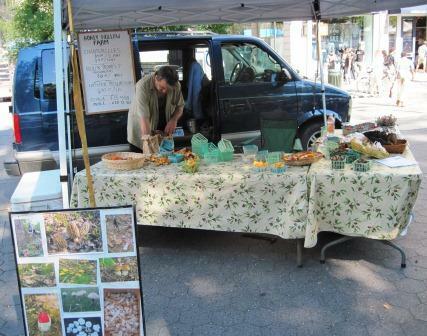 One day a week, at my local Greenmarket, the wild-mushroom man appears. His tiny stand starts in spring with the first morels and proceeds through the summer and fall with chanterelles, black trumpets, ovoli, porcini, sweet clubs, maitake, chicken of the woods, blewits, lobster mushrooms, oyster mushrooms, and any others his woodland prospecting turns up. I’m addicted to these little treasures. This summer there’s been an abundance of chanterelles – enough to interest me in some preparations more elaborate than a simple braise. 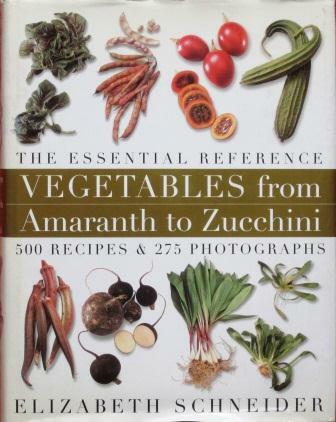 My recipe for this week is from Elizabeth Schneider’s Vegetables from Amaranth to Zucchini. It’s actually called Chanterelles Braised with Corn, Summer Squash and Carrot, but the appearance of the finished dish led me to dub it Chanterelles with Confetti Vegetables. You’ll see why. The “confetti” part of the dish consists of ¼-inch dice of zucchini and onion, 1/8-inch dice of carrot, and corn kernels cut from the cob. Tom saintfully did all this dicing for me too. Nevertheless, you persevere, making an act of faith in your author and her recipe. 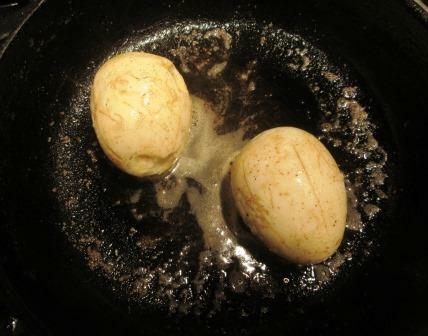 You add wine and water, simmer for 20 minutes, and strain the result. Somewhat to my surprise, it made a nice, mild, tasty broth – totally unlike anything that comes from a vegetable bouillon cube. From that point the recipe is simple. 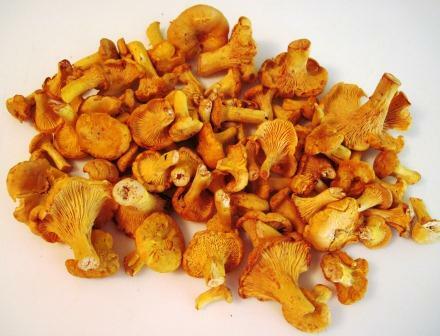 Start sautéeing the chanterelles and onion in butter and oil, add the carrot and shortly afterward the corn, then some of the broth; when that has evaporated, add more broth and simmer uncovered until the vegetables are tender and the liquid somewhat thickened. Finish the dish with lemon juice, softened butter, and chopped chives. The finished product is not as attractive to look at as its raw ingredients were, but that’s the only disappointment. It was tastier than it looks. Each mouthful contained tiny bursts of the flavors of each vegetable, led by the star of the production, the chanterelles. The two of us finished well over half of the portion meant to serve four. The sweetness of the vegetables matched nicely with a broiled tilefish fillet and an unusual white wine from the Tuscan Maremma, made from Vermentino and Malvasia grapes. 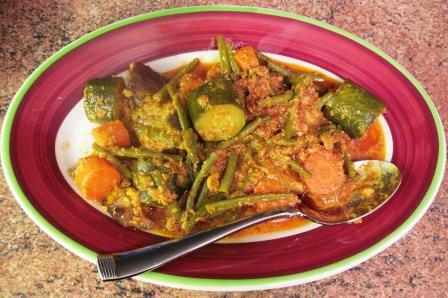 A few days later, having guests to dinner, I used the leftover vegetables, pulsed in a food processor, as a stuffing for braised quails. It was excellent! It’s sad when an old friend lets you down. This week, still in my older-books mode, I went looking for recipes in Jack Scott’s The Complete Book of Pasta. I bought it when it came out in 1968, five years before Marcella Hazan appeared on the culinary scene and started a great change in Italian cooking in American homes. Scott’s was a wonderful book to us then. (Tom simply drooled over its centerfold, shown below.) 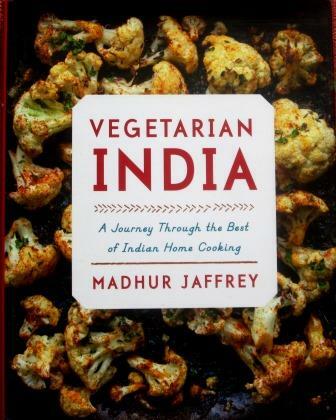 It gave us some recipes that have been favorites ever since. But many other Italian cookbooks have joined my collection since then, so I hadn’t gone back to it for anything new in years. Alas, it was not a good idea. First I tried linguine allegre – translated as lively linguine with anchovies. It’s actually a mongrel sort of sauce. You sauté anchovies, celery, red bell pepper, capers, olives, basil, parsley, and garlic in butter and olive oil. 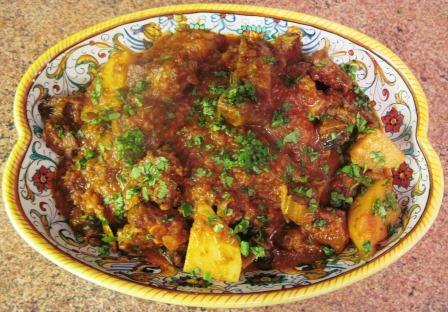 Stir this mixture into a simple tomato sauce and simmer it all for 40 minutes. Now, all those flavors are good, but having so many of them cook together for so long blurred their distinctions and didn’t produce any synergy. As opposed to the Spanish recipes I wrote about two weeks ago, in this case the whole seemed like less than the sum of its parts. An oddity was a direction to cook the linguine with less than the usual amount of salt in the water because of the saltiness of the anchovies. I think you’d need a fantastically sensitive palate for that to make a difference. Well, I said to myself, even Homer nods. Let’s try another one. Tagliolini freschi con carote, or fresh noodles with carrots, caught my eye because carrots aren’t often a featured companion to pasta. In fact, that name ignores two other principal ingredients: sliced mushrooms and julienne strips of prosciutto, quickly sautéed in butter and oil with the diced, precooked carrots. It sounded as if it’d be very nice on homemade egg noodles. It was nice enough, but there wasn’t anywhere near enough of it. The recipe called for 6 mushrooms, 4 carrots, and 8 slices of prosciutto. The only liquid was ¼ cup of the pasta cooking water, added to the sauté pan at the end. This was supposed to be enough to dress 1½ pounds of fresh egg noodles. Fortunately, I doubted that, so I cooked only half as much pasta. Even so, there were still a lot of nearly naked noodles on the plates, with hardly any flavor of the other ingredients. The recipe also called for grated parmigiano to be passed at the table, but trying a little on one forkful seemed only to emphasize the dryness of the dish. It did need salt and pepper, which weren’t mentioned in the recipe at all. Overall, another disappointment. I almost feel guilty to think that this book, which gave me so much pleasure in the past, now seems to be so unrewarding. But a lot has happened since 1968. Many trips to Italy have exposed me to wonderful regional pasta preparations. I’ve published 60 of my own pasta recipes in my two cookbooks and enjoyed many more from books by other people that have appeared over the years. There’s far more access to excellent Italian ingredients and more knowledge of how to bring out the best in them. So dishes that were once new and exciting now have a lot of powerful palatal competition. I guess, as the philosopher Zeno didn’t quite say, you can never dip a ladle into the same tomato sauce twice. Is Sunday the last day of the old week or the first day of the new? I’m calling it the first, though I might do another new recipe later this week. 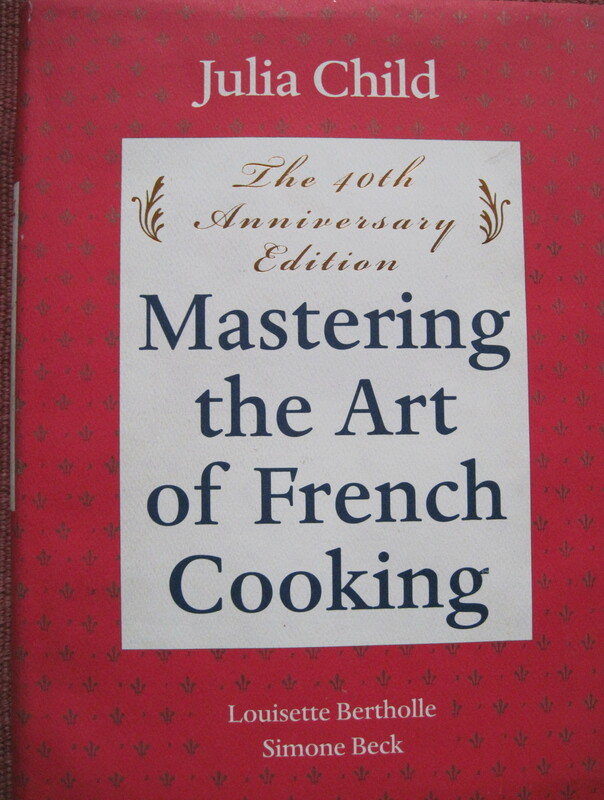 Today was Coquilles St. Jacques à la Fondue d’Endives, from a paperback Bistro book that sister-in-law Judy turned me onto. An attractive book that we haven’t used much, though it seems to be a bit arithmetically challenged: To serve 4, the recipe called for 12 sea scallops, which were at the end to be placed 5 to a plate. Oh well, I sometimes have troubles with my checkbook, so who am I to complain? Very nice dish, and very rich: Belgian endive sautéed in butter, scallops sautéed in butter, a sauce of lemon juice, butter (getting a theme here?) and crème fraiche. The sweetness of the scallops and the bitterness of the endive matched well, especially with all that b u t t e r.
The sauce was almost a beurre blanc, but easier to make. No shallots, no reduction of the acid ingredient. Just bring lemon juice to a boil, whisk in pieces of butter, and then add a nice dollop of crème fraiche. Also nicer than I expected was the endive treatment. This is a vegetable we rarely cook, but I can see doing it that way as accompaniment to a grilled meat, maybe – if it didn’t cost a fortune, which today’s pair of endives sort of did. 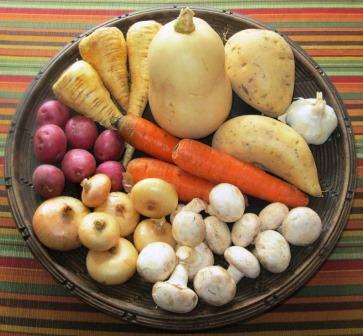 It’s not being a good winter for vegetables, and the ones available are ghastly expensive. But one must eat, non? The anniversary re-issue. My copy of the original volume fell apart from hard, loving use. We had the dish as a main course with a rice pilaf from Julia I, after an appetizer of fried oysters on a bed of frisée, with a brilliant little tartare sauce of Tom’s creation, involving capers, cornichon, and pickled ginger, all of which we happened to have in the fridge. These très riche scallops would be better, I think, in smaller quantities as a fish course in an elaborate dinner. We drank a French Sauvignon blanc with it – one of my least favorite white wines, but good with the dish. 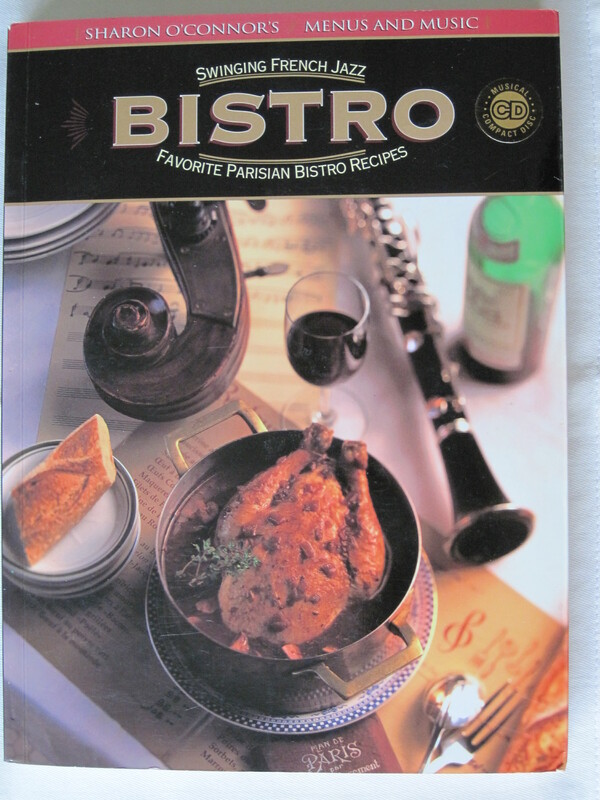 Which, by the way, the book says is from a Parisian bistro called Chez Diane near the Jardin de Luxembourg. A few days later: I did one more new recipe this week. 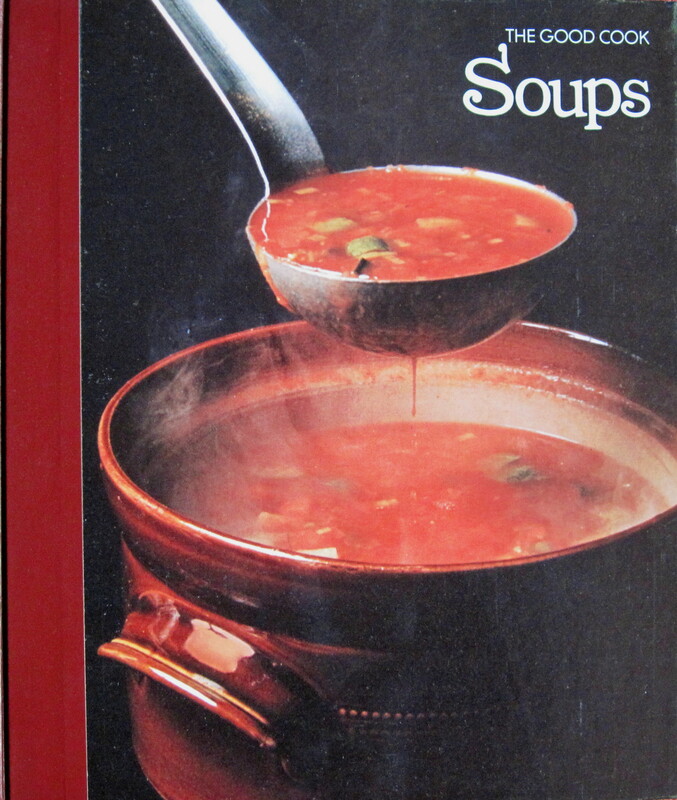 A carrot soup, originally published in a 1976 Terence Conran vegetable book, which I found in the soup volume of the Time-Life Good Cook series. I wanted something simple for a winter’s day, and this was certainly that. Sauté thinly sliced carrot and chopped onion in butter until soft; add stock, salt, sugar, and a bit of rice; simmer 20 minutes, then puree. I like carrots, and I used hefty, well-grown ones, so I hoped the soup would be okay even if it didn’t come out greater than the sum of its parts. Which it didn’t – should’ve known the Brits don’t really believe in flavor! It wasn’t bad; just lackluster. You could hardly tell it came from carrots. Helped immensely by some extra salt (recipe called for only “a pinch” for a pound of carrots and a quart of stock) and a spoonful of crème fraiche stirred into each bowl. It was a sketchily written recipe. When I write recipes (I’ve published more than 500), I try to anticipate what people might not think of for themselves. But this one said nothing about cooking covered or uncovered, so if anyone had tried to sauté the carrots uncovered, they’d have become shrapnel before ever softening (mine took 30 minutes covered, with a fair amount of tending). Also, the final simmering with only the amount of liquid called for and no lid on the pan would’ve thickened the puree to a paste, and burned it on the bottom, without frequent stirring. Recipe writers shouldn’t assume so much knowledgeability in readers.